Michael Lee - a name guaranteed to evoke a gut reaction from those who've followed speedway for thirty years or more. Will you immediately think of the gangly kid who emerged from nowhere to become World Champion or will you recall the man with an unbelievable natural talent who seemingly threw it all away? All sides of this character are covered in 'Back from the Brink' the new biography by Tony McDonald. Using contributions from Michael himself, his family, friends and foes, we're taken on a journey from his youthful promise, through genuine global achievement leading to an unbelievable fall from grace. One suspects this book was originally envisioned to be a ghost written auto-biography from Michael's perspective. That it's evolved into something largely about him, rather than by him, is probably due to the fascinating insights that these other contributors make. They can recall how things actually were, rather than how they appeared to be from Michael's perspective. Michael himself does remain the main contributor to the book, refreshingly offering few excuses for some of his behaviour along the way, never quite giving the impression that he truly regrets some of the things you feel he ought to. Looking back on his early career it's difficult to comprehend just how quickly he became a world class rider. There was no lengthy apprenticeship for Lee, he was competing with the very best long before his teens were finished. Backing from his family played a big part in this, both in terms of their experience in motorcycling and the financial contribution they were able to make. The other factor that could be overlooked is just how hard he worked to achieve his success. This is something that strikes you in the book, Michael Lee loved speedway and thought of little else as a young man. Working alongside his father Andy, he was manufacturing his own components to give his machinery a competitive edge. In truth he was many years ahead of the pack in this regard and the lessons he learned at that formative stage of his career are still paying dividends for him in the present day. Another thing that stands out you is just how intelligent Michael is, when he truly applies himself to something he tends to be very good at it. This even extends to his ill-advised move into drug dealing, he established a very profitable 'business' before inevitably getting caught. He's keen to stress that he always 'dealt' rather than 'pushed' drugs - it's up to the reader to decide if this distinction matters much to them. The book certainly doesn't attempt to gloss over the less commendable aspects of Lee's life and career. It's clear that he's hurt many of those closest to him over the years and they don't hold back in their disapproval of some of the things he has done. His parents, Andy and Val, are particularly frank in their comments and the book is all the better for it. Without this kind of honesty we wouldn't be getting the full story, so praise is due to Lee himself for allowing these views to be represented in what is effectively 'his book'. Illustrated throughout by a large number of photographs, the story is told in chronological order. His racing career is covered in great detail while the key stages of his later life are also afforded a good deal of space. The final chapters of the book find Lee back on the world stage as tuner/advisor to Tai Woffinden. It seems to be a role he relishes and he appears to be in a much better frame of mind than for many years. Lee's story is an interesting one, he's certainly led a more eventful live than most of his contemporaries. Whether you're interested in solely his on-track career, or his life as a whole, you'll find more than enough of interest to justify the cover price. 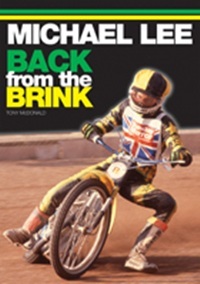 To order your copy of Back From The Brink for �16.00 (post-free in the UK), visit the publisher's website at www.retro-speedway.com or phone Susie on 01708 734 502 to pay using your debit/credit card. "Michael Lee was one of my favourite riders and I just had to buy this book. I did so with some trepidation given that Michael's past problems are well known and I didn't want to read "too much information" in case it detracted from the fond memories I have of his on-track performances. I needn't have worried, the book is extremely well written and I got through it very quickly. Two things stand out for me. Firstly, talented young sportsmen (and sportswomen) need a committed mentor, particularly in a sport such as speedway where the emphasis is focused on individual achievements. Secondly, Michael asserts that all young people will be faced by the choice of whether or not to take drugs and I would have liked him to take the opportunity to offer some advice on what actions we can all take to influence youngsters faced with those choices. Despite the heavyweight issues involved, my abiding memory is of hurtling down the back straight at Blackbird Road (Leicester Stadium) before sliding full throttle round the City bend and into the home straight. In summary then, this is a book well written by Tony McDonald and well worth reading." "Don't sit thinking about buying Mike Lee's book, go out and buy it now, you will not be disappointed. This is the best read since Kenny Carter's story. I finished it in four days and could not put it down. I now feel like I know Michael, and really like the guy now, he seems so genuine."